Many people have to face this challenge of speaking before a large audience. Some people may feel comfortable speaking with one person or a small group but when they have to face a large group, they would shiver. But for how long can you save yourself from such situations? Two times, four times but not for the life time. It is extremely important to learn the art of Public Speaking. Public speaking and confidence building are generally considered complimentary to each other because of the fact that it is really essential to have high level confidence to speak before public. Public speaking is an effective method to improve confidence. Public speaking can be practiced every now and then. You only need to find the situation and grab the opportunity. You can improve confidence through public speaking. By joining meetings, groups, debate clubs, public speaking course and presenting to small groups. It will gradually make you more confident to speak before huge audience. Public speaking will then start making you feel relax, help your interpersonal skills so that you may converse naturally and also improve your vocabulary. 1. An appropriate vocabulary will help you give better presentations, because you’ll be able to pick exactly the right words to get your points across. 2. Knowledge of your topic, and being familiar with the associated terminology, will give you immense confidence to make the presentation. 3. Make sure that your presentation or speech is organized and easy to follow. 4. Take the opportunity to interact with your audience before giving your presentation as people are more inclined to listen to friends rather than strangers. 5. Relax and enjoy yourself. Be cheerful. 6. Look your best as this is also one of the most important things that will help you to be confident before the audience. 7. Focus on what you have to say even if you do not have any Power Point Presentations or audio/visual aids. A good public speaking course is the one which give stress not only on public speaking but also other related aspects like how to gain confidence, personality development, improving English, presentation skills, convincing power and many more. All this may be done through power point presentations, role plays, impromptu speeches, prepared speeches, games etc. And one such institute which covers all the above mentioned things and more in its public speaking course is ANURAG AGGARWAL INSTITUTE OF PUBLIC SPEAKING. 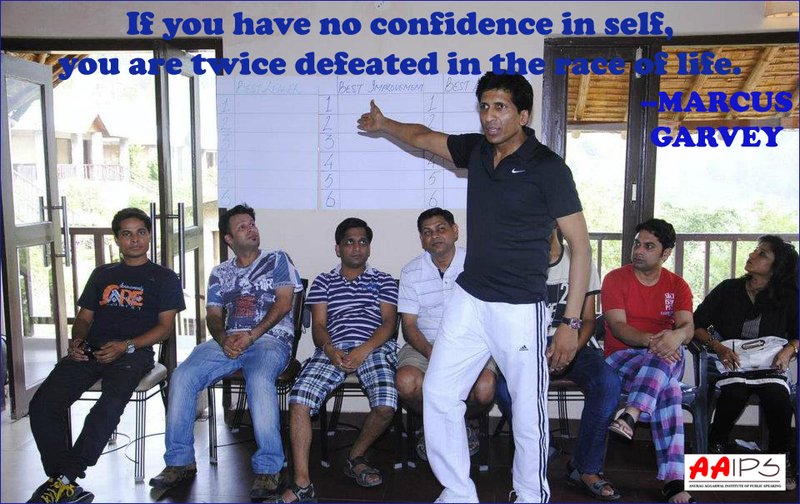 It is the best public speaking institute in India. For over 12 years thousands of students have learned how to speak confidently from this institute. Visit www.anuragaggarwal.com for more details on public speaking, personality development and presentation skills course or call Nupur Bansal at +91-9971776852. Next postWHAT IS PUBLIC SPEAKING?